Traveling to Richmond, Virginia? Don’t miss these incredible, family friendly sites that are fun and inviting for families with young kids! Trevor’s been reciting this phrase for days. It all started when we walked into the “Speed” exhibit at The Science Museum of Virginia in Richmond. As soon as we stepped into the exhibit, we all zeroed in on the race track with the giant digital timers overhead. Visitors could sprint down the track as the digital clocks recorded race times. Displays compared how well those recorded times stacked up against the top speeds of Olympic gold medalist sprinter Usain Bolt. Of course we had to try! First, Chris and I raced. Then Tru had to get in on the action, so I raced Tru. Of course, none of us came close to Bolt’s time. And Trevor didn’t even understand the goal of beating the race times that were displayed. During our travels to Richmond, Virginia, we found so many sites that were fun and inviting for families with young kids. Of all of the sites we explored in Richmond, the Lewis Ginter Botanical Garden was my favorite. The grounds were so scenic and the gardens were gorgeous. To make things even better, the Botanical Garden is really welcoming of children. The conservatory had a cottage that was Trevor-sized. There was an International Village display, complete with mini replicas of globally inspired homes and gardens native to that region. Plus a huge fruit and vegetable garden where kids were free to explore. And we all loved walking the ramps up to the top of the Treehouse, for incredible views of the garden lake and surrounding fields. We even saw a small splash park and fountains, although the weather was too cold for Trevor to try it out. The Lewis Ginter Botanical Garden is such a special place for families! We visited the Children’s Museum of Richmond Downtown (the West Broad Street location), and thought it was the perfect spot for families with young kids. In our opinion, this museum seems to be geared mostly to toddlers and preschoolers. Trevor, age 2, loved everything! …to the Tree House, where he could climb up high and then ride down a tunnel slide. Chris and I loved the region around the Virginia State Capitol because of its fascinating history. And Trevor loved the area because the park, with rolling hills and fountains and statues, was for pedestrians only. So he was free to roam and explore! This area of Richmond was beautiful, clean, and really scenic. We loved checking out the Virginia Washington Monument and the Old City Hall building. Some family friendly sites are great for kids. The Science Museum of Virginia was different. Chris and I loved it too! We especially loved the “Speed” exhibit that I described in the intro to this post (above). Oh, and if you’re wondering, that massive plane suspended from the ceiling in the photo above? That’s an SR-71 Blackbird supersonic jet. These aircraft were used during the Cold War and flew at speeds beyond 2,000 mph! Tru (and Chris and I!) loved trying out all of the interactive experiences. Chris and Trevor, for example, had so much fun trying to beat a robot at air hockey. First, the robot won a game. Then Chris beat the robot, 2-1! The museum building is also fascinating! The building was actually a train station that opened in the early 1900’s. I enjoyed checking out the towering arched windows and beautiful columns in the lobby. Another cool feature: the gorgeous domed ceiling is now a movie theater for the museum. Visitors can buy popcorn and tickets for astronomy- and nature-themed movies that are displayed on a giant IMAX screen. 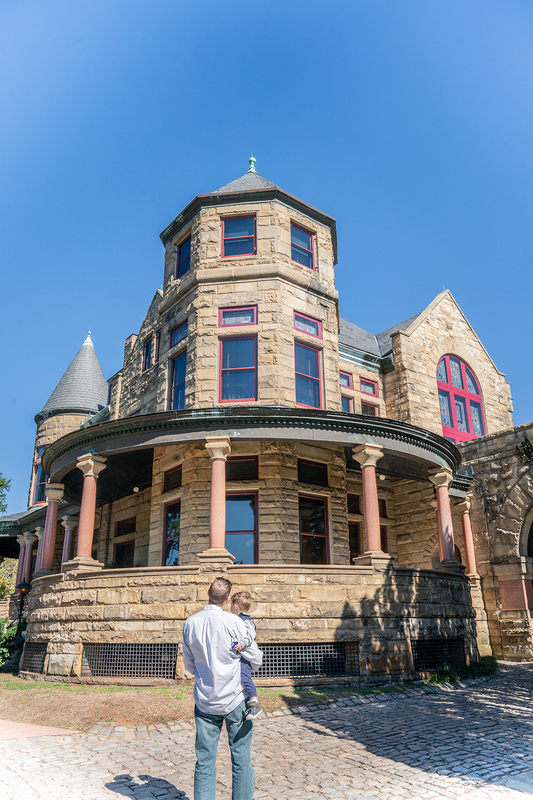 Maymont is the perfect place for families. There are acres of rolling hills and pathways through beautiful gardens. We loved checking out the Maymont Mansion (tours through the interior of the mansion are available). There are stunning waterfalls and lakes and fountains. In addition, there’s also a nature center and a farm with wildlife exhibits and animal encounters. Maymont is one of those ideal sites that appeals to both children and parents too. I loved that Maymont was really scenic. I enjoyed taking photos and learning about the history of the property. And Trevor loved that was he was free to run, roam, and explore!